Edible landscaping involves growing edibles in the landscape but not necessarily in the traditional sense where they are planted in a garden spot. Fruits, vegetables, and herbs including some less familiar types can contribute to an attractive landscape and also provide sources of food. 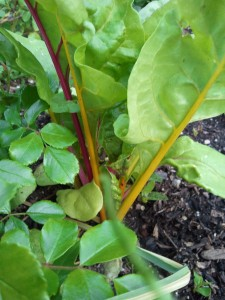 Edible plants can be used as groundcovers, shrubs, trees, perennials, annuals, vines. Some edibles can successfully be grown as houseplants. This is especially nice if you live in a climate where such plants will not survive outdoors. Start with what you know you will eat. Just because something is edible that does not mean it is tasty to you. Want to try something new? See if you can find it at a farmer’s market or grocery store first so you can try it. Be sure to accurately identify all plants before eating whether in your landscape or in the wild. Some edibles look very similar to toxic plants. Label plants when you plant them. How much effort do you want to go to? Blueberries require extra work in alkaline soils. Is it worth it? Research what will grow in your area. All plants below can and do grow in my zone 5/6 Utah area. Those listed under Indoors grow indoors in winter and most can spend the summer outdoors. Edibles in parking strips or along driveways may pick up toxins from automobiles. Plant as far away from the street as possible. Plant multiple fruit trees in one spot. Plant them at a slight angle away from each other – 3 apples, 3 to 4 peaches. If different varieties are planted with different ripening times that will extend the harvest. Espalier – fruit trees or currants. More fruit can be grown in a smaller space. Plant plants as an understory to other plants. Strawberries under raspberries, low growing herbs or greens under fruit trees. Trees – elderberries, juniper, mulberry, crabapple, mountain ash, hackberry, plums, chokecherry, almonds, walnut, hazelnut, cornelian cherry, and of course, apricots, peaches, pears, cherries, asian pear, apple, plums,– Before you plant think about where any fruit may fall. Vines – Passionfruit, sweet potato, kiwi, akebia, squash, grapes, melons, cucumber, wolfberry, hops, Schisandra, peas, runner beans, climbing nasturtiums, climbing rose, New Zealand spinach, mouse melon. Ferny – ferns, asparagus, plants in the parsley family including dill and fennel. Flowers – some flowers are edible – Nasturtium, violets, pansies, artichokes (let a few flower), calendula, daylilies, sunflowers, sunchokes, roses, chives. Others such as sego lily, camas, and saffron have other edible parts. Check reliable books for other edible flowers. Weeds – lambs quarters, dandelion, pigweed, chickweed, sorrel, miner’s lettuce, amaranth, milkweed, purslane, dock, stinging nettle (won’t sting when dried or cooked), catnip. Be sure of correct identification.